Ella Maillart was born in Geneva of well-to-do Swiss and Danish parents. As a child, she loved reading maps and adventure books and participating in sports. She became an enthusiastic skier and at age 16, founded and served as captain of the first women's field hockey club in French-speaking Switzerland. She took up sailing and with a close friend followed the ancient voyages of Ulysses to the Ionian Islands and Ithaca. 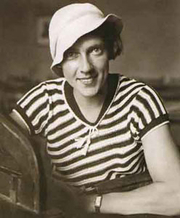 Ella represented Switzerland in the single-handed sailing competition at the Olympic Games of 1924, the only woman among competitors from 17 nations. She later wrote about these years in her book Gypsy Afloat (1942). Ella tried several different professions, including actress, artist's model, traveling saleswoman, movie stuntwoman, and teacher, but wrote, "Except when I was sailing or skiing I felt lost, only half alive." An encounter with Russian émigrés in Berlin gave her the idea to write about youth in Russia and the Russian cinema. She traveled to Moscow and walked through the Caucasus, returning to Europe via the Black Sea and Crimea. In Paris, she published a book about her journey, Parmi la jeunesse russe (1929), which established her as a writer. With two couples she met in Moscow she traveled to Russian Turkestan and the Tien Shan mountain range, meeting the Kirghiz, Kazak and Uzbek peoples. The resulting book was Des Monts célestes aux Sables rouges (in English, Turkestan Solo: One Woman's Expedition from the Tien Shan to the Kizil Kum, 1932). Le Petit Parisien, a newspaper specializing in foreign reports, sent Ella to China to investigate Japanese-occupied Manchuria. In Peking, she met Père Teilhard de Chardin. She also became reacquainted with Peter Fleming, a journalist for The Times of London, and with him traveled through northern Tibet to the closed city of Sinkiang and followed the ancient Silk Road before arriving in Kashmir, a 3,500 mile journey through some of the most remote areas of the world. Her book about the trip was called Forbidden Journey - From Peking to Cashmir (1935). Fleming published his own account of their trip in News from Tartary (1936). Ella continued to travel for Le Petit Parisien to Turkey, India, Iran, and Afghanistan, and went on lecture tours in Europe. She illustrated most of her books with her own photographs. In 1939, she undertook a trip from Geneva to Kabul by car, accompanied by Swiss writer Annemarie Schwarzenbach, who fell ill; the resulting book was The Cruel Way: Two Women and a Ford in Afghanistan. Ella spent the years of World War II in India and afterwards settled at Chandolin, a village in the Swiss Alps, where she built a chalet. In 1951, she went to Nepal, which had just opened its borders, and wrote The Land of the Sherpas. For the next 30 years, she organized cultural tours to various Asian countries. Her autobiography was called Cruises and Caravans (1950). Ella Maillart is currently considered a "single author." If one or more works are by a distinct, homonymous authors, go ahead and split the author. Ella Maillart is composed of 8 names. You can examine and separate out names.